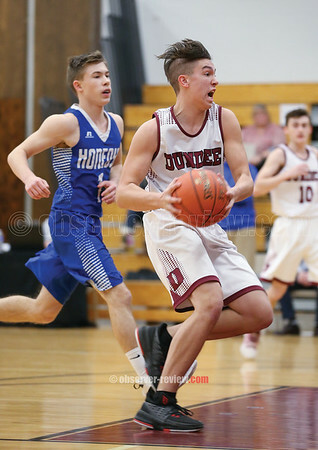 DUNDEE--Dundee's boys varsity basketball team fell to Honeoye in a home game, Thursday, Jan. 10. The final score was 74-43. Austin Gibson recorded 23 points in the game. Preston Cratsley had 10. The Dundee girls varsity basketball team topped Honeoye, 57-32, Thursday, Jan. 10. Makenzie Cratsley led the Lady Scots with 20 points, 16 rebounds, and six steals. Hallie Knapp also netted 20 points, with eight rebounds. Mackenzie Strait added 10 points, seven assists, and five steals. Megan Sutherland had five points, while Abigail Miller rounded out the scoring with another two points. The Lady Scots varsity bowling team beat Naples, Thursday, Jan. 10. Mercedez Roy led with a 424 series. Kayla Andrews posted a 371, followed by Edele Morgan with a 368. The boys lost. Hunter Murphy posted a 536. Connor Muck followed with a 437. Stephen Smith earned a 380. The Dundee boys varsity bowling team beat Honeoye, while the girls also won, Wednesday, Jan. 9. Smith recorded a 587 series. Murphy bowled a 548. Muck added a 533. For the girls, Morgan posted a 400. Sam Hunt bowled a 397. Mercedez Roy followed with a 356. The Scots' varsity wrestling team competed at the Robert Bradshaw Invitational, Friday, Jan. 11, and Saturday, Jan. 12. Dundee's Kenneth Empson Jr. (170) placed fifth in the championship for his weight class. Leif Hoyt (195) finished eighth. Dundee's wrestling team beat Lyons, 42-12, Wednesday, Jan. 9. Paul Knapp (132) beat Reinaldo Cuadrado. Leif Hoyt (195) topped Gideon Compton. Tate Hoyt (220) won against Jaegar Paliotti. Michael Eaves (99), Hayden Erick (145), Empson (182), and Harry Nice (285) won by forfeit. PENN YAN--The Penn Yan varsity basketball team lost to Midlakes, 59-47, Friday, Jan. 11. Ashley Sisson scored 13 points, with 11 rebounds. Peyton Comfort added 11 points, while Sierra Harrison earned 10 points. Jammie Decker netted five points, with five rebounds. Joddie Decker posted four points, eight assists, five steals, and four rebounds. Alex Cox and Taylor Hight each scored two points. Penn Yan fell to Wayne, Wednesday, Jan. 9. The final score was 55-49. Jenna Curbeau led with 12 points and seven rebounds. Harrison earned eight points, followed by Sisson and Jammie Decker each with seven points. Sisson also had six rebounds. Haylea Langan earned six points and five rebounds. Joddie Decker netted five points, with four assists and four rebounds. Comfort contributed four points and five rebounds. The Mustangs boys varsity basketball team fell to Midlakes, 62-50, Friday, Jan. 11. Conner Fingar scored 15 points and was 5-for-8 at the free-throw line. Peter Nicholson posted 12 points, followed by Kyle Berna with 11. Colton Smith and Peyton Schuck both earned six points. The Mustangs topped World of Inquiry in an away game, Monday, Jan. 7. The final score was 64-57. Smith led with 15 points. Nicholson added 14 points. Fingar earned 11 points and was 5-for-10 at the free-throw line. Berna scored eight points, while Mason Kuver had six. Schuck added five points. The Penn Yan varsity bowling teams both beat Marcus Whitman, 5-0, Thursday, Jan. 10. Jon Mashewske led the boys with a 566 series. Cameron Bassage added 552. Trenton Samatulski posted a 537, while Connor Harmon earned a 532. Ben Broome had a 509. For the girls, Kari Ayers posted a 621. Emily Augustine bowled a 573. Emilie Thomas earned a 436, followed by Brandee Ellis with 434. The combined Marcus Whitman/Penn Yan varsity wrestling team finished 13th at the Robert Bradshaw Invitational, Friday, Jan. 11, and Saturday, Jan. 12. Jarred Calice (138) was third in his weight class. Charlie Burgess (138) and Colton Yerkes (195) finished six. Aiden Mowry (113) placed eighth. The Marcus Whitman/Penn Yan team lost to Midlakes, 64-18, Thursday, Jan. 10. Mowry (113) beat Aiden Conge in 5:05. Calice (138) topped Matt Raes in 1:51. Burgess (145) pinned Kain Bennett in 3:15. HAMMONDSPORT--The Hammondsport girls varsity basketball team defeated Campbell-Savona, 61-27, Friday, Jan. 11. Destiny Hammond scored 19 points, with four assists, three rebounds, and three steals. Tea Flynn earned 14 points, with eight rebounds and three assists. McKenzie Boscoe followed with 12 points and seven rebounds. Ana Salom posted six points and seven rebounds. Paula Garcia netted five points, with three steals. Maddie Sprague earned four points and four rebounds. Jillian Underhill posted one point, six rebounds, three assists, three blocks, and three steals. Hammondsport's boys varsity basketball team lost to Campbell-Savona, 58-55, Friday, Jan. 11. The Lakers took the lead in the third quarter, outscoring the Panthers by 12 points. However, Campbell had a comeback to win late in the fourth quarter. Parker Watson led Hammondsport with 21 points and five steals. Hammondsport fell to Avoca, 77-54, in a home game, Wednesday, Jan. 9. Despite losing, the Lakers outscored Avoca in the second and fourth quarters. Watson netted 16 points. Byron Stevens and CJ Hill added 12 points each. The Hammondsport boys lost to Bloomfield, 62-50, Monday, Jan. 7. CJ Hill scored 14 points. Thomas Kressly and Watson each posted 11 points. WATKINS GLEN--The Watkins' boys varsity swim team lost to Odessa-Montour, Thursday, Jan. 10. The final score was 102-67. Nathaniel Wickham won first in the 50 freestyle (25.02) and first in the 100 freestyle (56.37). Daine Butler placed second in the 200 IM (2:47.56), while Steven Gublo took second in the 100 backstroke (1:20.52). Clint Craven finished third in the 200 freestyle (2:33.39) and third in the 500 freestyle (7:22.89). Scott Brubaker was third in the 200 IM (2:52.67) and third in the 100 breaststroke (1:27.75). James Jensen placed third in the 100 butterfly (1:56.68). The Watkins swimmers were beaten by Waverly, 133-49, Tuesday, Jan. 8. Wickham won first in the 100 freestyle (55.87) and third in the 50 freestyle (25.04). Brubaker took second in the 200 IM (2:55.27). Georgio Fazzary placed second in diving (141.25). Gublo finished second in the 100 backstroke (1:24.71). Gabe Santos took third in diving (134.55). The Watkins Glen varsity indoor track teams competed at the Finger Lakes Running Club open meet, Sunday, Jan. 13. Haley Dean ran the 60 meter in 8.9 seconds, establishing a new school record. She also ran the 400 meter in 1:10.7 replacing the old record set by Abby Stamp of 1:11.4. Cal Sutterby set a new record in the 60 meter with 9.0 seconds. Maddy Hansen ran the 60 meter in 9.8 seconds, followed by Thalia Marquez in 10.9 seconds. Kaylana Rekczis established a new record in the one mile race walk with 10:13. Several non-indoor track athletes also competed in the open event for Watkins. Max Evans ran the one mile in 5:15, followed by Elliott Holland in 5:49 and Nick Bonsignore in 6:46. Evans also ran the 400 meter in 57.5 seconds. The Watkins Glen varsity bowling teams both blanked Lansing, 4-0, Tuesday, Jan. 8. H. Nathaniel Rose led the boys with a 622. Wyatt Brower posted a 594 series. Wrett Brower followed with a 517. RJ Bannon added a 493. Matt Irwin posted a 444 series. For the girls, Nikole VanDyke bowled a 511. Nancy Jackson earned a 479 series, followed by Hayley Cornish with a 476. Makenzie Kellogg added a 441. Alyiah Clink-Bentley posted a 344. The Watkins Glen boys varsity basketball team defeated Addison, 60-49, Wednesday, Jan. 9 at home. Joe Chedzoy, Isaac McIlroy and Mitchell Pike all had 12 points in the game. ODESSA--The Odessa-Montour boys varsity basketball team lost to Marathon, 64-53, Friday, Jan. 11. Devon Mahaney led with 20 points, going 4-for-8 with free-throws. Zach Elliott followed with 18 points, also going 4-for-8 at the free-throw line. Paden Grover scored seven points. Derrick Lewis added six points. "This was by far the best game of Devon's varsity career," said Coach Matt Johnston. "He was aggressive on both ends of the floor and was looking to take the ball to the rim." Odessa's boys fell to Groton, Tuesday, Jan. 8. The final score was 59-46. Elliott scored 13 points. Lewis had 11 points, while Mahaney earned 10. Grover netted seven points. Preston Harris contributed five. Dylan Houseknecht, a senior at Odessa-Montour, won the 285 pound championship at the Robert Bradshaw Invitational Wrestling Tournament at Canandaigua Academy. Jan. 11 and 12. Houseknecht won his first place bout against Anthony Oca of Webster Thomas by a pin in 4:54. Houseknecht won all four of his matches during the tournament, in which 23 schools participated. He currently has a season record of 27-0. Other wrestlers from the O-M/Watkins Glen team who participated in the tournament, but did not place, included Andrew Hartford, Josiah Lynch, Collin Haag and Joshua Beckley. The Odessa-Montour girls varsity basketball team beat Groton, 62-32, Tuesday, Jan. 8. Alexis Saunders led with a season-high of 17 points. Sara Gardner scored 16. Olivia Grover netted 14 points, with 10 rebounds and five blocks. Kara Reese added six points, followed by Hannah Chapman with four points. Grace Vondracek contributed two points, eight rebounds, and six steals. Jolynn Minnier had two points, while Kennedey Heichel added one point and 10 assists. The Odessa-Montour girls varsity bowling team defeated Groton, 3-1, Tuesday, Jan. 8. Jackie Vincent bowled a 441 series. Pixie Kinner posted a 374, followed by Jana Arias with a 372. Des Minnier added 322. The boys lost 4-0. Eric Rumsey posted a 531, which was the highest series for either time. Dominic Elliott earned a 437, while Austin Hoyt had a 374. The Indians' boys varsity basketball team beat the Senecas, 102-67, Thursday, Jan. 10. Brett Walters placed first in the 100 butterfly (1:11.13) and first in the 500 freestyle (6:12.93). Justin Ruocco was first in the 100 backstroke (1:19.81) and second in the 200 freestyle (2:26.87). Bailey Hornbrook finished first in the 100 breaststroke (1:22.68) and second in the 50 freestyle (25.90). Jacob Mayette won the 200 freestyle (2:12.02) and second in the 100 freestyle (56.91). Johnny Neidermaier took first in the 200 IM (2:40.47) and second in the 100 butterfly (1:20.96). The Indians' boys varsity swim team defeated Lansing, 61-33, Tuesday, Jan. 8. The 200 medley relay team (Hornbrook, Caleb Thomas, Mayette, and Walters) was first with a 2:07.10 time. The 200 freestyle relay team (Mayette, Noah Hollenbeck, Thomas, and Micah Brewster) took first with 1:54.46. The 400 freestyle relay team (Brewster, Niedermaier, Hollenbeck, and Tyler Carson) placed first in 4:32.06. Walters was first in the 50 freestyle (25.06) and in the 100 fly (1:09.08). Brewster placed first in the 500 freestyle (6:35.77). Mayette was first in the 200 IM (2:40.25).